Is your child’s myopia getting worse year after year? WE CAN HELP SLOW DOWN OR STOP ITS PROGRESSION! Myopia (or short-sightedness) is a progressive condition, which means in most cases it will get worse. So it’s not surprising if your child’s prescription has continued to increase over the years. A common question asked by parents: ‘Will glasses make my child’s eyes worse?’ The sad reality is they were getting worse without wearing glasses anyway! We know that normal glasses are the least effective way to slow down myopia progression. We know that children with high myopia are at increased risk of developing retinal detachment, cataracts, glaucoma and blindness in the future. We’ll take the time to answer all your questions about myopia and talk about your options. We’ll monitor how much and how fast your child’s eyes are changing and tailor-fit our care so you’ll get the best possible outcome. Eyecare Kids optometrists will take the time to provide timely advice on several possible treatment options for slowing or stopping the progression of myopia. Little guide, big on information! 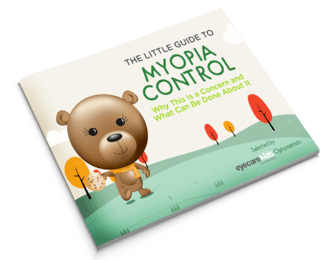 Know how you can slow down or stop myopia progression. Prepared by your local Sydney optometrists. Ortho-K is a non-invasive way to combat the progression of myopia in children and the effect is from 60-70%. Multifocal Contact Lenses have been shown to be effective at slowing down myopia to 30%. An easy option, these lenses are worn during the day for clear vision for both objects far away and near. Atropine (an eye drop used daily) has been found to reduce the progression of myopia generally between 60-70%. We know how important time spent outdoors is in helping preventing myopia. SLOW DOWN or STOP your child’s myopia from getting worse. EyecareKids © 2018. All rights reserved.